Co-curator of art exhibition, Robinah Nansubuga commented on the institution’s failure to understand the artist who planted the tree, Helen Zeru. 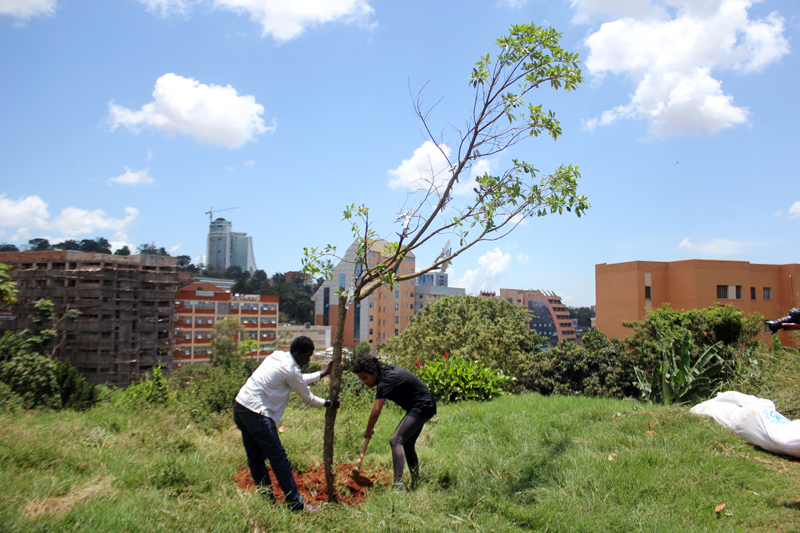 ‘For the KCCA, trees are simply to provide shade and to make the city look beautiful, but for an artist, it is the issue behind planting the tree,’ Nansubuga said. Though the authority’s vision is to be a vibrant, attractive, and sustainable city, according to its website, it made planting the Mutuba in the railway gardens close to impossible. One wonders if the historical Mutuba can symbolize KCCA’s poignant vision at all. Helen Zeru, from Ethiopia, was invited by the curators of the art exhibition to respond to the theme of Unmapped. This concept focused on the creativity of survival in East Africa’s capital cities. For Zeru, survival was portrayed in the journeys of Eritrean and Ethiopian refugees that she met in Kampala. ‘I took the tree as a metaphor: the process of uprooting and replanting a tree in a new place, to see if the roots would find their way back into the soil again,’ Zeru said. Unable to uproot the Mutuba in Kampala, Zeru had found and uprooted one miles away in Masaka, with the help of fellow artist Babirye Leila. Yet she didn’t know then, the many difficulties the art project would face. It was in the difficulty of replanting the tree that the immigrant experience of anguish, fear, and otherness manifested. ‘The tree’s journey showed why refugees are forced to flee, and the incidents that happen in between home and their planned destination,’ Zeru said. The tree has, elsewhere, been a symbol for refugee protest. 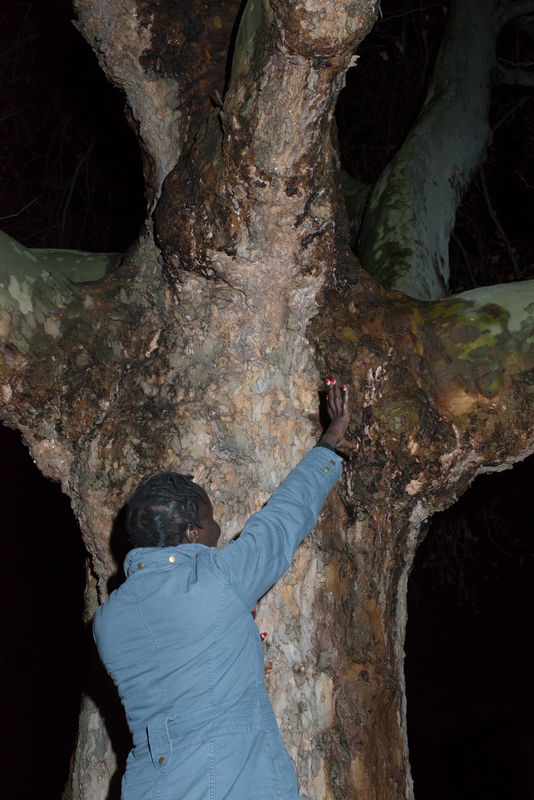 Earlier on in April, when South-Sudanese refugee activist, NapuliLanga climbed, and stayed in a tree for four days in Berlin, the tree captured the resilience of the refugee protest movement among African refugees in Germany. ‘According to Germany’s constitution, the dignity of a human being is untouchable. Is mine touchable or untouchable now?’ said Napuli filmed on a tree in a YouTube report. 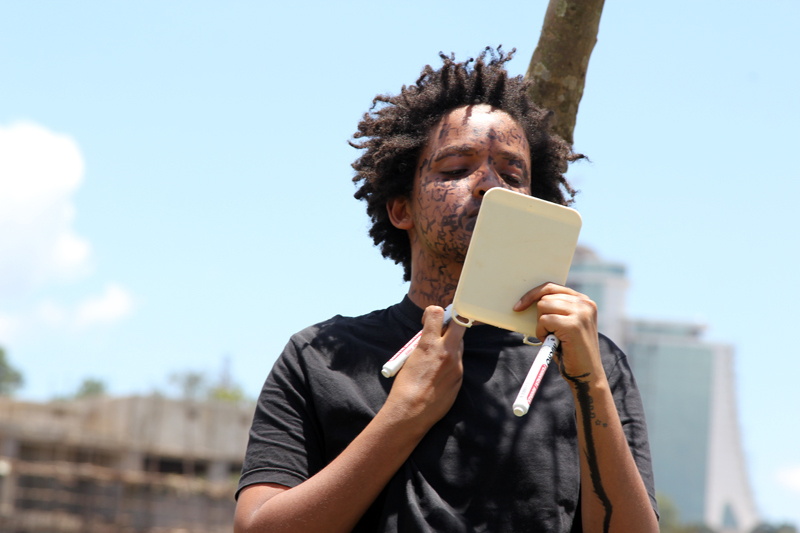 In August, when the Mutuba arrived in Kampala, the KLA ART team was prohibited from planting the tree in the railway gardens. According to exhibition director, Rocca Gutteridge, trees undergo similar procedure as permanent structures under the KCCA. The authority is responsible for maintaining public gardens, and restrict street decorations, shelters, or temporary buildings, and other structures in public space under the KCCA Act. As a permanent structure, the tree was outlawed. In September, placed briefly in Kansanga, the tree began to wither and dry as it lost its leaves. This became the ultimate inquiry of Zeru’s art project: do immigrants survive in a new place, or do they wither and die? The loss of life inspired the artist to make an appendage of metallic wind chimes, the artist’s innovation of sonic life. For both Zeru and Langa, the tree became symbolic for the fulfilment of aspirations and dreams. For Zeru, the tree showed her desire to root the uprooted; for Langa, the tree raised her concern to register the unregistered. Furthermore, the resistance towards both woman artist and activist, from constitutional law, reflected how those same aspirations and dreams were shattered in the face of human injustice. In early October, the exhibition team received a letter of permission from the KCCA to plant the tree in a car park on Makerere Hill road. But this letter was no guarantee, as the team had to pay the car park owner a fee. As KLA ART 014 took off with audiences watching; as Zeru dug a hole on the land overlooking the Makerere-Kivulu valley, she questioned: whose public space is it anyway? The art project, and its many difficulties exposed issues of public ownership in the city. The constitutional limitations of citizen’s, and indeed immigrants hinder our sense of place in the world we live. Moses Serubiri is co-curator of the KLA ART 014 festival. He is also a seasoned writer and poet living in Kampala.